Quentin Tarantino says slavery continues in the United States. The outspoken filmmaker — whose spaghetti southern Django Unchained unflinchingly depicts the brutality of slavery — stoked the debate on race Tuesday night when he appeared on the Canadian television talk show George Stroumboulopoulos Tonight to suggest that the United States' "war on drugs" and its "mass incarcerations" of black men is "just slavery through and through." Tarantino didn't cite these figures, but he could have: According to the New York Times, half of the 2.3 million Americans in prison or jail are black, an astonishing figure when compared to 2011 U.S. Census information that indicates blacks comprise only 13.1 percent of the country's population. In other words, he's got a point, and this is a conversation our country should stop avoiding. Tarantino was promoting Django Unchained, which opens Christmas Day, on Stroumboulopoulos' CBC show when he made the controversial comments, and it will be interesting to see whether they get any traction in the U.S.— especially since the national debate is now focused on gun control in the wake of the Newtown, Conn. shootings. 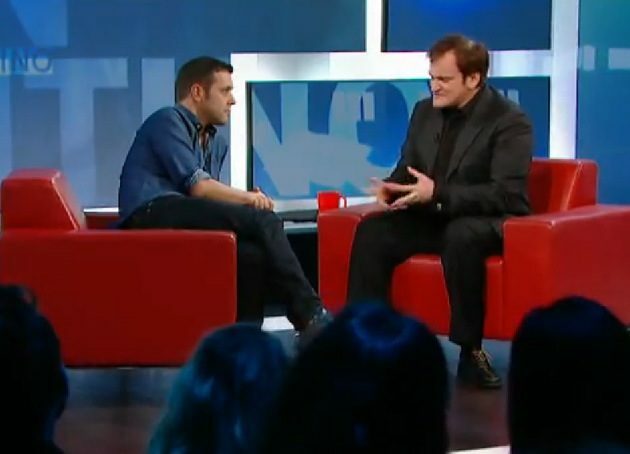 A spokesman for George Stroumboulopoulos Tonight provided Movieline with a video clip of Tarantino's segment and a transcript of his comments. Check them out below and let me know whether you agree with Tarantino's remarks in the comments section. George Stroumboulopoulos: So you know this film is gonna deal with the conversation about race in America today, people will talk about it. What do you feel about where it’s at? Quentin Tarantino: Uh… It’s… You know, there is… On a day-to-day, day-in, day-out basis for most people in America, it’s okay. Things have gotten a lot better. People are a little too sensitive to talk about stuff, and that’s a drag, but you know that’s, that’s how it is. But on a bigger level, it’s very depressing. This whole thing of the, this “war on drugs,” and the mass incarcerations that have happened pretty much for the last 40 years has just decimated the black male population. It’s slavery, it is just, it’s just slavery through and through, and it’s just the same fear of the black male that existed back in the 1800s. And uh, you know there’s a reason – I mean, especially having even directed a movie about slavery, and you know the scenes that we have in the slave town, the slave auction town, where they’re moving back and forth. Well that looks like standing in the top tier of a prison system and watching the things go down. And between the private prisons and the public prisons, the way prisoners are traded back and forth. And literally all the reasons that they have for keeping this going are all the same reasons they had for keeping slavery going after the whole world had pretty much decided that it was immoral. QT: Because it's like, because it’s an industry. And one, what are we gonna do with all these people that are let loose, you know, these black people let loose, and two, what are we gonna do about all of the people that make money off of this industry? I don't think that the shootings will detract from the issue of mass incarceration of addicts in our prisons. Most prisons are filled primarily with mentally ill and addicts who commit drug related offenses. The "War on Drugs" feeds the prisons, but the lack of suitable mental health treatment (which if untreated often leads to self medication with substances) is the root of the shootings. My hope is that thinking people will insist on a national discussion and solutions that lead to less stigma, more and better treatment, and a realization finally that the brain is an organ, and like all of the other organs in our bodies, can get ill. Mental Illness and chronic addiction are brain disorders that must be treated, not punished. The shooters Mother tried desperately to get help for her son because she knew his behavior was erratic and unstable. But no help came. Instead she was laughed at by a Judge when she asked for her son to be committed. The result was she is dead, her son is dead, and many many more innocent lives were lost. Namsate, my sis-star. I am sorry for your loss ann I wish you well and that your spirit is intact for the struggle you so well discribe. "keep on keepin on " and God bless you. Well I truly liked reading it. This article offered by you is very practical for proper planning.